At the start of the American Civil War, German spy Gunter Rohlenheim is sent by Prince Otto von Bismarck to the United States to gather intelligence on the development of an advanced warship. Before Gunter can find his way to his intended target, his nemesis from ten years earlier sends an assassin to neutralize him. Barely escaping death, Gunter is surprised when his investigation uncovers more advanced war technology being developed by the Confederates. Angamar, an enigmatic old scientist, connives to include Gunter into his development of a self-propelled torpedo, and Gunter discovers the reincarnation of his own first engineering project, a submarine. The Confederate submarine experiment evolves into the H. L. Hunley and Gunter, using the alias Sam Miller, is consumed with his desire to become part of her crew. When the Hunley is called up for duty as a blockade breaker in Charleston, South Carolina, Gunter is forced to choose between loyalty to his homeland, the submersible, and an attractive war widow. The forensic reconstructions of the H. L. Hunley's crew sparked the ides of Convergence of Valor. Guntis Goncarovs is an analytical chemist by education, historian by interest, and storyteller by passion. Coupling storytelling of his discoveries of the analysis of the details historical mystery of the demise of the H.L. 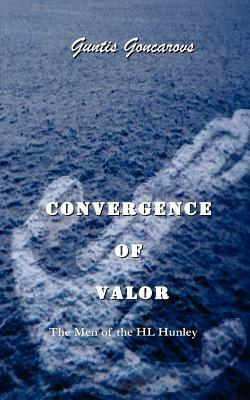 Hunley led to the idea of the sailor's story, culminating in Convergence of Valor. Goncarovs and his wife, Joan enjoy the wonders of New Hampshire with their dog, Sasha. Aquatic and terrestrial gardening, spotted with trying to keep up with three grown daughters keeps them hopping. More information about Goncarovs can be accessed at www.gggoncarovs.com.